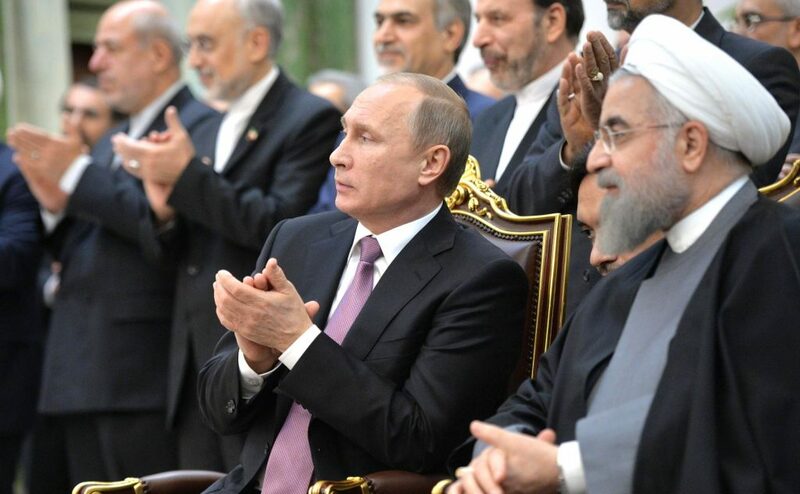 President of Russia, Vladimir Putin (left) President of Iran Hassan Rouhani (right). In 1937, Neville Chamberlain became Britain’s Prime Minister and continued his predecessor’s appeasement policy with the “Warlike” nations when Hitler and Mussolini kept testing the reactions of the Anglo-French foreign policy. The result was encouraging for the Fascist regimes to continue violating the Versailles Treaty, occupying foreign lands, and impelling for more. D id the appeasement policy stop Hitler from occupying most of Europe? Did it prevent the Anglo-French alliance from war? Did it convince Hitler to change his foreign policy and attitude? The answer, as we all know, is NO, and we all know that the cost of the appeasement policy was higher than the world could handle. Then why shall we believe that the appeasement policy will work with Iran? How will it work with Russia or with Bashar Al Assad? Iran and Russia are doing nothing less than what Hitler did before World War II. Russia provoked and occupied sovereign lands in Georgia in 2008 and the world did little to prevent it from happening. What’s more, the west was quick in going back to business as usual with Russia. The “Reset” too followed shortly after. It will be fair to say that the inadequate reaction Russia received from the US, Georgia’s main ally, and other world super powers encouraged Russia to continue with its plans. It then went on and occupied parts of Ukraine and the entire Crimea (although a lot of then Georgian officials tried hard to warn the world that Russia will not stop there and will continue with its expansionist plans) and now they are in Syria. On the other hand, Iran is heavily involved in Iraq and their militias are fighting on their behalf throughout Iraq’s sovereign land. Iran’s influence on Lebanon turned it into an almost failed state with no president in place for almost two years now, supporting Bashar Al Assad’s regime who’s responsible for killing more than 250,000 people and displacing millions of his own population by sending in their own revolutionary guards and Hezbollah fighters and sending weapons and other means of support. They are also supporting the Houthi militias in Yemen to seize the presidential palace and coup against the national agreement by means of force and violence. Iran keeps trying to destabilize Bahrain and Kuwait by sending in weapons and training over a thousand Bahraini nationals to attempt an upheaval and spread terrorism across the country, killing and injuring civilians and police forces. Terrorist attacks linked to Iran were carried in Saudi Arabia that killed hundreds of civilians including many Americans and Europeans. A failed attempt to assassin Saudi’s former Ambassador to the US and current Foreign Minister Mr. Adel Al Jubair, attacking and destroying the British Embassy in Tehran, attacking the Saudi Embassy in Tehran and attaché in the Iranian city of Mashhad are just few examples of their “heroic deeds”. Iran will not change because the president is moderate as Rouhani or radical as Ahmadinajad. It will not change because its Iran’s ultimate goal to remain a revolution and not as a state. It is stated in Iran’s constitution that it must continue to export Iran’s Islamic Revolution to every country around the world, to support those who are vulnerable and helpless according to Iran’s supreme leader and in blatant violation of the international law and sovereignty of other states. If Neville Chamberlain was among us today he would undoubtedly have acted differently. He would have understood that the appeasement policy would allow Adolf Hitler to become more aggressive and encourage him to presume that no one will stop him from occupying Europe; he would have known that conceding to aggression can make confrontation or even a war is inevitable. Regardless the cost nations of the free world should act immediately to stop aggression and expansionist plans or the cost of inaction will be much higher. And incase you are wondering, the nuclear deal has nothing to do with stopping Iran’s aggression and expansionist plans. When the US announces that they have a common goal with Russia to defeat terrorism and stop ISIS, it does not change the fact that most of Russia’s airstrikes are against the moderate oppositions fighting against Al Assad’s regime and ISIS at the same time. When the US secretary of State flies to Riyadh after the nuclear deal is signed and announces that Saudi is an important ally does not change the fact that Iran will receive billions of dollars when the sanctions are lifted with no guarantees, that it will not use these funds to continue supporting terrorist groups and spreading chaos in the region. Believing that just by giving Russia the benefit of the doubt would help divert their intensions, or that by agreeing to pause Iran’s nuclear ambitions for ten years will automatically change Iran from a country that uses non-state armed groups to achieve its foreign policy objectives into a country that advocates for world peace and fights against terrorism, is simply risking the world’s peace, stability and order. Those, who believe that a moderate new president will change Iran’s behavior I remind them that Rafsanjani was considered the most moderate president Iran had since ending the Shah’s regime. However, it was during Rafsanjani’s period that Hezbollah was established. They should also be reminded that hundreds of prisoners were executed during Rouhani’s period, who is considered by the west a moderate president. Rewarding terrorists isn’t going to change them or change those who are supporting them. In fact the opposite is the case, as they will be encouraged to do more unless someone stops them. Turning a blind eye to the violations of international law and other states’ sovereignty isn’t going to change the reality that those in violation will continue until they are forced to stop. The cost of stopping them depends on when they are stopped- the longer it takes the higher the cost. Winston Churchill, Franklin D. Roosevelt and Charles De Gaulle would probably not have been in WWII if Neville Chamberlain did not accept Adolf Hitler’s aggression and agreed on the Munich Pact in 1938 allowing Hitler to seize parts of Czechoslovakia to Germany or at least would not have been in a war to recover most of Europe from Hitler. Meanwhile, I do hope that the new president of the United States won’t have to be in a war to protect US interests and help his allies recover more occupied sovereign lands than already seized or violated either by occupying states, dictator regimes or terrorist groups.